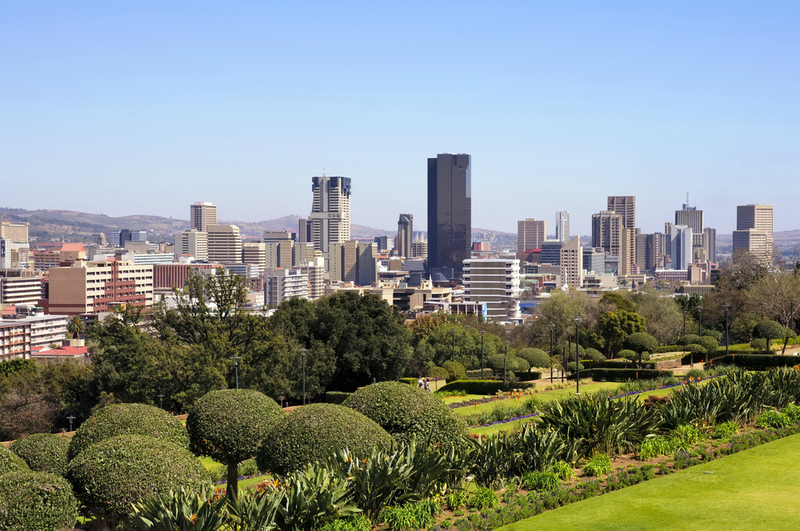 South Africa’s capital city, Pretoria (also known as Tshwane or the Jacaranda City) is a city full of life and historic value. 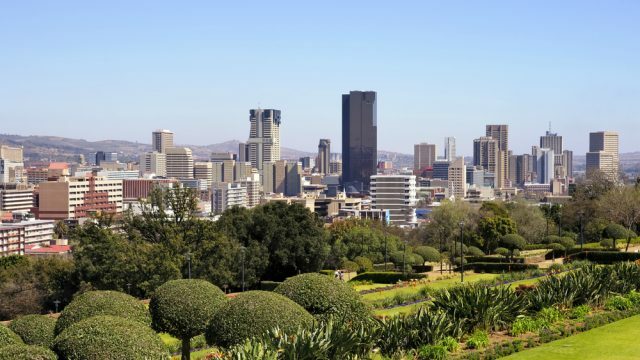 A city that is often passed over and forgotten about due to its more popular and overpowering neighbour – Johannesburg. But Pretoria has its own beauties and charms, ask any inhabitant of the city and they will tell you tales of their love and passion for their city. 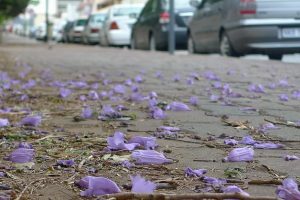 The first things that pop to mind when thinking about Pretoria is their purple lined streets during spring (October-November) when the Jacaranda trees come into full blossom, the blue lined stadium and pubs when the Blue Bulls (their national rugby team) are playing and the green drinks of Cane and Cream Soda that the students go crazy for in Hatfield. Here are a few tips to take note of where to go and what to do when visiting Pretoria to make sure that you make the most of what the city has to offer. 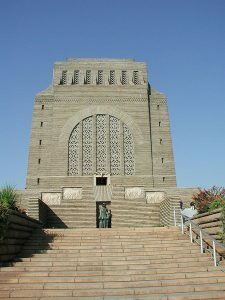 On the ‘must see’ list of Pretoria’s sights is the Voortrekker Monument which was built to commemorate the Voortrekker Pioneers and their journey from the Cape colony into the interior of the country. While there you can visit Erfenissentrum, the centre dedicated to Afrikaners and how their life used to be. Then you’ll also have to take a trip to the Union Buildings, the official seat of the South African Government (SA’s version of the White House). Take another step back into South Africa’s history at Church Square in the CBD where you will see the city’s first church, built in 1855. Get a sense of some of South Africa’s cultural history at the National Cultural History Museum or the Art Museum. Another good museum to visit is the National Museum of Natural History. A great activity if you have kids is to spend a day at the Pretoria Zoo, they have a wide array of animals and a really amazing aquarium. Another fun place to take the kids is Irene Dairy Farm just outside of Pretoria, check out the animals, take a stroll along the grounds and enjoy some delicious freshly prepared food at their restaurant. While in the area, you can visit Jan Smuts House, an ex-president of South Africa. If you’re there on the first Saturday of the month then you can catch the Irene Market on the same grounds. Pretoria has something for all kinds of tastes. For a no-fuss good ‘ol burger try out Burger Bistro, which has all sorts of gourmet toppings to choose from. If you’re still in the mood for something relaxed then head over to Alfie’s, a small Italian restaurant in the Hazelwood area. For a fancier fine dining affair, make a reservation at De Kloof and enjoy their grass-fed beef and duck. Get a taste of Indian cuisine at the family run Geet Indian Restaurant. Then during the day you can grab a sarmie at the Lucky Bread Company to keep your belly happy while venturing around the city, or a delicious piece of cake and cup of coffee at Isabella’s Cake and Food Shop. Hatfield Square is Pretoria’s notorious party place. Close to the University of Pretoria (known by the locals as Tukkies), you will almost always find streams of students partying it up in the bars and clubs at the square. Expect a big party on student nights and start and end of term. Catch some awesome local bands at Arcade Empire, where you will quite often find big event nights happening with some of South Africa’s top local bands. Or for something a bit more cultural, have a look at what’s on at the State Theatre and enjoy a night of dance, jazz and drama. To satisfy absolutely all of your shopping needs take a trip to Menlyn Park Shopping Centre. This mall has every kind of shop imaginable, from fancy name-brand fashion outlets and shoe shops, to furniture and interior design shops, plus many others. If you can’t find what you’re looking for here, then you may have to find it online! You can also go to Kolonnade Shopping Centre or Brooklyn Mall. Like any other large South Africa metro area, Pretoria offers a range of accommodation from five-star to budget backpackers. On the high end there’s Isiphiwo Boutique Hotel and Spa, where you can go for pampering, spoiling and sheer relaxation. Then there is Castello di Monte, a five star guest house in Waterkloof Ridge oozing luxury and sophistication. And the Sheraton Pretoria Hotel, another popular and timeless hotel in city. Hotel 224 is a recently modernized hotel that offers an affordable, simple and sleek stay in the city. You can’t really go wrong with the popular Protea Hotels chain, and the Protea Hotel Capital is conveniently located in the centre of the city so getting around will be easy. Much like the Arcadia Hotel, which has been around for years and keeps on bringing visitors back. Pumbas Backpackers is a fun and lively backpacker hostel for those looking for cheap accommodation. By air: Johannesburg’s OR Tambo International Airport is the primary airport that serves Pretoria. Flights from around the world and around the country are served by OR Tambo, which is 46km (29 miles) from the center of Pretoria. Some flights within SA utilize the much smaller Lanseria Airport, which is 52km (32 miles) from Pretoria. 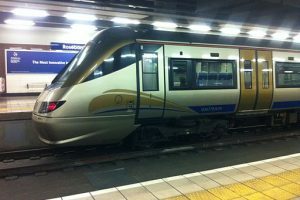 By ground: The most economical way to get into Pretoria if you are flying into Joburg’s OR Tambo Airport is to catch the Gautrain. This takes you directly from the airport to the Joburg suburb of Sandton, where you can switch trains, then proceed directly to Pretoria. 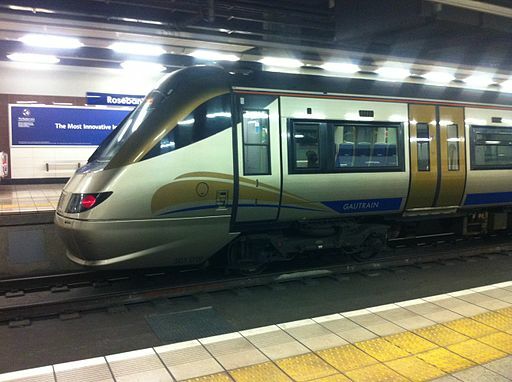 Gautrain has stops at either the Pretoria CBD station, or the Hatfield station. If you don’t want to take the train, a taxi from OR Tambo to central Pretoria will cost you at least R600 (US$55). To get to Pretoria by bus from Johannesburg or any other major South African city, services such as Translux, Greyhound and Intercape can take you there very cheaply from the central bus station. Getting around: Once in the city, it is probably the easiest to rent a car to drive around yourself. There are many car rental companies that offer a range of cars. It will work out much easier and cheaper than getting private cabs, as the taxi and bus service is rather tricky to figure out. Otherwise, some of the hotels do offer a shuttle service for areas in close vicinity. Weather: Pretoria is always a few degrees hotter than Johannesburg, offering a generally warm climate throughout the year. Winters are short and dry, averaging around 20 degrees Celsius. Summers are long, hot and rainy, averaging around 28 degrees Celsius. The best time of year to go is in October/November – the weather is starting to heat up but not too hot just yet. 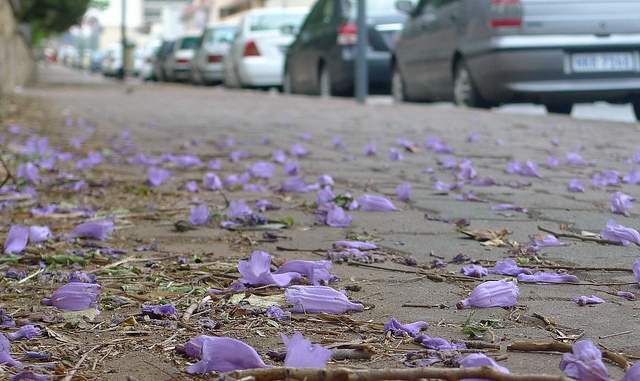 And the Jacarandas are in full bloom, making the streets purple. Safety: As with other cities in South Africa, crime is possible, but not commonly inflicted upon the average tourist. Suggested precautions: Travel in a group if you go out in the evening. Don’t carry lots of cash or jewelry on you. Don’t stare at your phone while walking (especially if you are alone), as distracted tourists can become targets for opportunistic thieves. Try to use cash where possible, as credit and debit card numbers are stolen frequently. Banking and money: There are hundreds of national and international banks with ATMs and branches in Pretoria, including American Express, Citibank, NedBank, FNB Bank, ABSA, and Standard Bank. Most ATMs will allow you to withdraw money from your bank back home, if they share the same network. Try to withdraw a large chunk of cash at a time, to avoid getting repeatedly dinged with international exchange fees. Standard banking hours are 9am-5pm, Monday through Friday. Credit cards are accepted at larger hotels and restaurants.